Your local retailer’s regularly scheduled in-store events are the steady pulse of Legend of the Five Rings: The Card Game Organized Play. Organized Play exists to help you find more opportunities to play, meet new players, welcome potential players, and enjoy both casual and competitive experiences. Stronghold Kits introduce custom prizes that reward your participation in the game's community. Each Stronghold Kit is designed to support three Dynasty Leagues (of four weeks each)—or three Conflict Tournaments—as well as one additional special event. These kits come with dozens of alternate art and extended art cards, custom tokens, and other gaming components. These items, when you claim them, provide additional color to your conflicts in Rokugan. Each Legend of the Five Rings: The Card Game Stronghold Kit comes with materials to support up to 32 players in as many as 12 weeks of Dynasty League play or 3 Conflict Tournaments. The result is that your favorite local game store becomes your stronghold—the place where you can enjoy consistent support for Legend of the Five Rings: The Card Game Organized Play. In fact, each Stronghold Kit even includes a number of promotional Patronage Cards for retailers to reward players who purchase Legend of the Five Rings products at their stores. 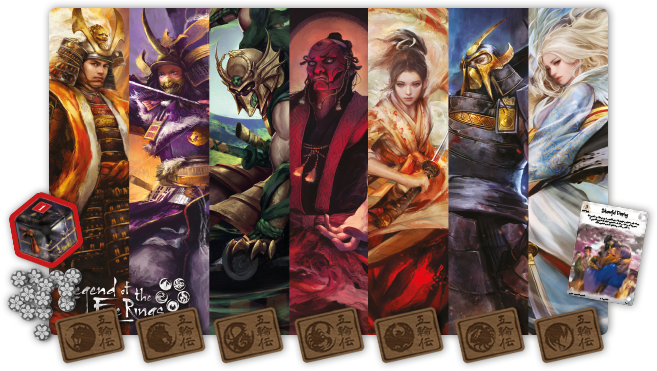 Simply pick up a Dynasty Pack, playmat, or Clan Pack when you show up for your 2018 Season One game night, and you get an extended art version of the Wandering Ronin card (while supplies last). You will also find participation prizes, prizes for the top competitors, prizes for the top players from each Great Clan, and a single copy of most cards in the kit that is intended for the event organizer to award or keep at his or her discretion. All told, the 2018 Season One Stronghold Kit contains 247 extended art cards, 13 metal fate tokens, 7 clan specific first player tokens, 7 plastic Dragon Clan-themed Imperial Favor cards, 4 custom playmats, and 1 acrylic honor dial. Read the “Prize Structure” section below for more information about how you can earn these prizes. In order to support the best possible Organized Play experience for your local Legend of the Five Rings: The Card Game player base, we have designed our Stronghold Kits so that each of them allows event organizers to choose between two exciting models of play and prize distribution. Specifically, the 2018 Season One Stronghold Kit is structured so that its contents can be used to support either a Dynasty League of twelve weekly events or three monthly Conflict Tournaments. As you may note, the weekly events correspond with a single month’s worth of prizes, so event organizers may—if they wish—alternate between a Conflict Tournament one month and a Dynasty League the next, or any such combination. During Season One, each retailer will use the contents of the Stronghold Kit to host an additional special event. The 2018 Season One special event is the Stronghold Showdown—a special event that allows players to gather for spirited competition and clan politics. The 2018 Season One Stronghold Kit supports a Stronghold Showdown of up to 32 players. Has your group grown beyond the 32 players supported by the Stronghold Kit? If so, that’s great! It also means that you should talk to your local retailer about the Reinforcement Packs they can use to supplement larger events. Each Reinforcement Pack comes with enough cards to support 8 more players throughout the season’s weekly or monthly events. Alternatively, your retailer can use these cards to host even more in-store events, or to ease into Legend of the Five Rings Organized Play with fewer, smaller events until you can build your player base up to the larger and more exciting events supported by a Stronghold Kit. Just as with the Patronage Cards from the Stronghold Kit, the Patronage Cards in the Reinforcement Packs are meant for retailers to hand out with each Legend of the Five Rings purchase (while supplies last). Updated on January 10th, 2018 - Made minor corrections to prize descriptions.